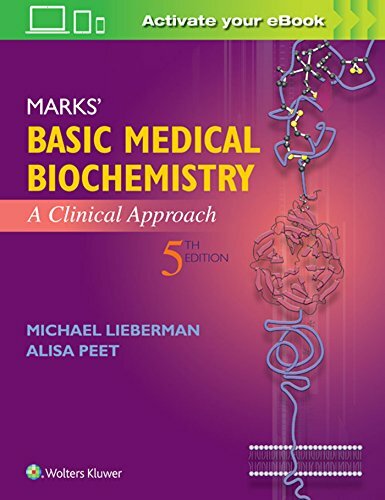 Marks’ Basic Medical Biochemistrylinks biochemistry to physiology and pathophysiology, allowing students to apply fundamental concepts to the practice of medicine – from diagnosing patients to recommending effective treatments. Intuitively organized chapters center on hypothetical patient vignettes, highlighting the material’s clinical applications; helpful icons allow for smooth navigation, making complex concepts easier to grasp. Full-color illustrationsmake chemical structures and biochemical pathways easy to visualize. Clinical Notesexplain patient signs or symptoms, and Method Notesrelate biochemistry to the laboratory tests ordered during diagnosis. Clinical Commentslink biochemical dynamics to treatment options and patient outcomes. Biochemical Commentsexplore directions for new research. Key Concepts and Summary Disease tableshighlight the take-home messages in each chapter. Questions and answersat the end of each chapter – 470 total inside the book, with 560 more online – probe students’ mastery of key concepts.